On July 17th and 18th I had the opportunity to attend the 2018 Home for Everyone Conference in Green Bay, WI. Every year, the Wisconsin Collaborative for Affordable Housing puts together a conference for developers, service providers, and design professionals to come together to discuss and promote overall access to safe and affordable housing throughout the state for economically disadvantaged individuals and families. Each year, the goal remains the same: to remove the negative stigma from ‘Affordable Housing’ and develop new ways to better educate the public on the need for affordable housing, through promoting collaboration between the public and private community groups. In this post I really want to focus on the presentations and discussions I sat in on, as well as the roundtable discussion I had the opportunity to be a part of. While there were numerous presentations to attend, I wanted to share my experiences and key takeaways. The conference was kicked off by Lisa Rice, who is the current president and CEO of the National Fair Housing Alliance out of Washington, D.C. Her presentation was titled “Where You Live Matters” and she couldn’t be more correct. She discussed redlining, as it came about in the 1930s by the Home Owners’ Loan Corporation to evaluate mortgage risks in specific areas. Rice showed us a Residential Security Map of Milwaukee from 1938, which indicated 19 areas within the city that had been ‘red-lined’ for various reasons like pollution, heavy industry, lack of modern sewage, and/or outdated housing stock. 4. Red – hazardous areas. According to various researchers, it was, in fact, determined that some of these areas were initially ‘red-lined’ because of the people who lived there – Polish residents, Mexican residents, Jewish residents, and African-American residents. Residing within a red-lined area made it almost impossible to achieve any economic success in one’s life because although renting was possible, owning a home was out of the question. There were also racially restrictive covenants in Milwaukee which limited who could live within specific neighborhoods throughout the city. In fact, one covenant still stands today. It’s set to expire in January of 2024 for the George T. Hansen Subdivision in South Milwaukee which disallows the ability for blacks to own or rent within the subdivision. Along with the segregation of communities, it was noticed that banks would not locate themselves within low-income areas, a trend that has seemed to continue. Without banks, residents in these areas today are often forced to go to a check-cashing service where they are charged hefty fees to have instant access to funds. “There are/were three main reasons people use [check cashing] services instead of banks: cost, transparency, and service.” There are no hidden fees within check-cashing – their fees are posted right when you walk in; with banks, you need to understand when fees are charged – ATMs, low balances, account types, etc. The study went on to show that many banking customers had been financially hindered by both hidden fees and the timeframe of waiting for money to process. These reasons coupled with the lack of customer service at inner-city branches leads to an overall mistrust of banks in general. The need for different, affordable housing options was made very apparent in Rice’s presentation. However, the strength of her presentation was in outlining the various needs of the individuals who were defined as the ‘economically disadvantaged’ population – community services, mental health services, financial services, and all other services typically classified as ‘wrap-around’ services. This discussion continued into the next workshop I participated in. Presented by Linda Ketcham and James Hawk of the Madison Area Urban Ministry (MUM), the workshop was aimed towards educating the group about the severe need for halfway homes and transitional housing for individuals recently released from the prison system. The statistics were rather alarming. Anywhere from 500–900 individuals are released from the state prison system each year, with another 1,600–2,000 from county jails. The Wisconsin Division of Community Corrections (DCC) only funds 75 halfway house beds and another 34 Transitional Living beds – each for a 30, 60 or 90-day period only. The lack of housing assistance individuals receive as they are reintroduced into society is a key catalyst to why 66% return to prison. From our perspective, we should keep in mind that it costs $38,000 per year to incarcerate one person in the prison system in Wisconsin. If we worked towards creating more housing opportunities with additional wraparound services for this group of individuals, we could drastically reduce the return rate as well as utilize those financial resources elsewhere. The dialog surrounding this demographic led to another presentation on the increasing population of grandparents becoming the legal guardians of their grandchildren oftentimes due to a parent becoming incarcerated. Nicole Solhelm of Gorman & Company put together a panel to discuss their current Grandfamily Housing project here in Madison, WI at Union Corners. The panel consisted of Derek Moran and Leah Gubin of Lutheran Social Services (LSS) of Madison, Senior Social Worker Julie Swenson (Dane County), and myself speaking about (yes, you guessed it) the benefits of the Intergenerational Housing model. The Grandfamily housing typology addresses the underserved population of grandparents that are the sole custodians of their grandchildren. Those that qualify will receive reduced rent rates. LSS will be providing numerous wraparound services to both the grandparents and the children that will resideat Union Corners. This housing typology option is very important in the lives of these children, as oftentimes they have no other option than to enter the foster care system. The affordability of the housing also allows for the grandparents to provide a safe and comfortable living environment for the children and establish the understanding of community within the children at a younger age. Designing a space for two generations (seniors and children), must be carefully planned out and studied. This project will be the first in Madison that integrates the Intergenerational Housing typology. 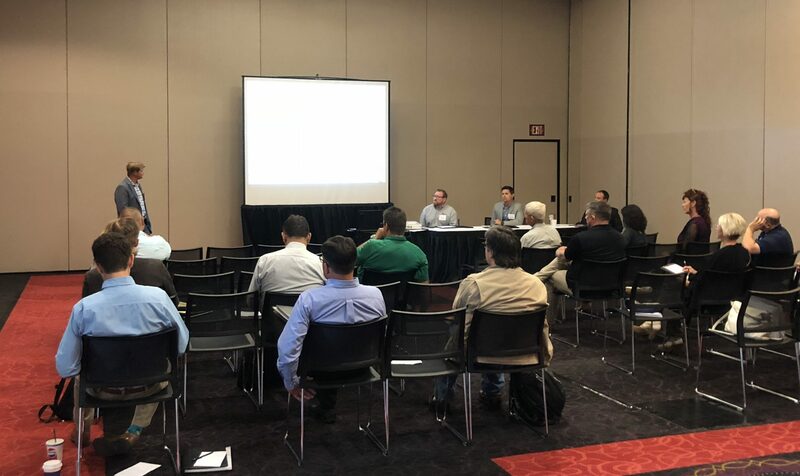 JLA’s Adam Fredendall (Madison office director) paired up with developer Jacob Klein (JT Klein, Inc.) and McGann Construction’s Aaron Kostchiska to wrap up the second day’s workshops with a presentation on the best practices for controlling construction costs. The trio discussed the recent affordable housing endeavors of JT Klein, Inc. A focus was brought to the collaboration of the design team with the developer, to plan a building that would allow for a variety of unit types within an affordable setting. In a design-build relationship, receiving early input from the construction team as well allows for the construction costs to be kept under control while the developer can focus on maintaining their project pro-forma while addressing the needs and requirements of WHEDA (Wisconsin Housing and Economic Development Authority) if LIHTC credits are desired. They emphasized that these relationships need to remain fluid so that the most affordable and successful projects can be accomplished. Overall, the conference was much more than just about the affordability of housing options. Every presenter illustrated a supportive service or group of needs that were pertinent to the success of the affordable communities. These communities are not supposed to just be designed for the ‘economically disadvantaged’ to have a place to live; they are supposed to be an opportunity for these individuals to have an affordable, safe place to live while planning for their future, whether it be financial savings, job opportunities, etc. These communities allow for adults to raise families in safe environments while also accomplishing their own goals and even one day having the opportunity to save up enough to own a home. The ‘American Dream’ is something that everyone wants, but not everyone can achieve by themselves (not for lack of trying). We are not all cut from the same cloth. Everyone has their own stories; maybe it’s the environment they were raised in or perhaps a lack of family and community. But whatever the reason is, it should not be an uphill battle to achieve the same success as ones’ neighbors. There is one tangible element that every person deserves the right to–HOUSING.